Edinburgh’s Dog Jog at Holyrood Park returns for 2019! The Dog Jog series are unique 5k jogging events for you and your dog to get fit and have fun. Each event offers a relaxed and fun atmosphere with no times and no pressure. They are also a great opportunity to meet like-minded dog owners. 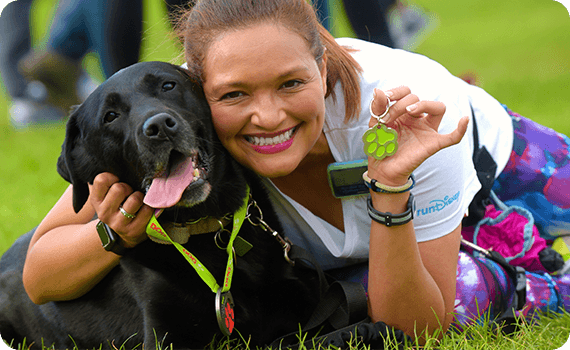 Plus what’s more, when you cross the finish line you’ll receive a fantastic Doggy Bag jam-packed with goodies for both you and your dog, as well as a Dog Jog Collar Keyring medal! Dog Jog is all about getting involved, having fun and enjoying the great outdoors with your favourite four-legged friend! The start/finish area is located on the playing fields to the rear of Holyrood Palace and only a short distance from the Scottish Parliament. This is on the north side of Holyrood Park of Queen’s Drive. The course takes advantage of the excellent tarred surface as it follows Queen’s Drive around Arthurs Seat. The route passes by the Salisbury Crags, the three lochs of Duddingston, Dunsapie and St Margaret’s and enjoys extensive views across Edinburgh. Please note that the route may be subject to change. The car park adjacent to Holyrood Park on Queen’s Drive gets extremely busy with the event and other park users. Parking is also available in the underground car park next to Dynamic Earth. But please don’t assume you will be able get a parking space there and allow plenty time to find an alternative parking place. Drop off points are Holyrood Park Road or Regent Road. Otherwise, you may have to walk 10-15 minutes to the starting area so plan your journey accordingly. Pedestrian access is available via all entrances. Runners are encouraged to consider public transport or car sharing. The Dog Jog Edinburgh route starts and finishes on an open flat area of grass and from then onwards, the route remains on a tarmac path throughout, until reaching the finish area. There is a major hill to go up an down and wheelchair users may require assistance to climb and descend the hill which covers 4km of the route.